An amnesiac young Lieutenant in Atlantis suffers from disturbing nightmares that he is a Wraith, only to make a shocking discovery about himself. A man in the infirmary wakes with a severe case of amnesia. Atlantis’s Dr. Elizabeth Weir and Lt. Colonel John Sheppard, along with Dr. Carson Beckett, tell him that he was captured by the Wraith, and is recovering from injuries. His name is Lt. Michael Kenmore, and he serves under Sheppard’s command. Holding an injection needle, Dr. Beckett tells the man he is diabetic and must take insulin to stay alive. Michael is disoriented and understandably frustrated, but trusts the people who are there to help him. Meanwhile, Weir and Sheppard’s team agree that Michael must be kept under close supervision. Dr. Kate Heightmeyer, the base’s psychologist, recommends reintegrating the young officer into society to speed up his psychological recovery. But Dr. Weir orders bodyguards to attend him wherever he goes. Michael is a nice young man who just can’t remember who he is. But he is sure he’s not being told everything. He attends a counseling session with Dr. Heightmeyer, but she can’t give him a satisfactory answer. In several incidents, it becomes obvious that many Atlantis personnel are uncomfortable with Michael and definitely lying to him about something. Michael has a conversation with McKay and realizes he himself knows about Wraith technology — but he can’t remember how he knows. Teyla visits Michael in his quarters and reveals he is from Texas, showing him a picture of his parents to help him get reacclimated and to try and spark his memory. But Michael can’t remember anything about it, except to say that Teyla herself seems familiar to him. She smiles and tells him that they are friends. Since Michael needs physical therapy, Teyla works out with him and instructs him in a sparing match. Michael obviously knows how to fight. He throws Teyla to the ground hard, slamming his hand on her chest to hold her down. Teyla is caught off guard, but Michael feels a rush of exhilaration. With pure hatred, Ronon suddenly appears to protect Teyla, throwing Michael against the wall and choking him. The guards and Teyla have to intervene, explaining it was just a training session. He leaves in a huff. At night, Michael has terrifying dreams. He sees himself walking down corridors inside a Wraith ship. He dreams that he looks into a mirror and a Wraith looks back. Waking up terrified, he is completely confused. At the gym, he confides in Teyla, who reassures him that many people have had such dreams — including herself (“The Gift”). She tells him the constant fear of the Wraith is the cause, and not to worry. Later, she reports the conversation. Something is clearly wrong, and Weir suggests that Dr. Beckett up the dose of what he is giving Michael — but he hesitates for safety reasons. Unable to sleep, Michael decides to get some sedatives from Dr. Beckett. In the corridor, he meets up with Sheppard and Ronon. Michael apologizes to Ronon for whatever may have offended Ronon in the past and offers his hand. Ronon fixes a deadly stare at Michael and refuses to shake his hand. Michael is confused and steps in the way of Ronon to try and sort out the problem. But Ronon punches Michael in the face and a fight breaks out. Clearly both men are extremely aggressive fighters, and have to be pulled off one another. When the pills don’t help, Michael goes back to the infirmary with his guards in tow. There, he finds Beckett asleep at his desk. Michael notices data disks with his name on them and, with no one looking, purloins the set, hoping to find out more about what has happened to him and why no one is telling him the whole story. Back in his quarters, Michael proceeds to put the disks into his laptop. He orients his position so the security cameras can’t see what he is reviewing on his computer. He watches video of his treatments day by day, each day more disturbing than the next, all the way back to the beginning. Beckett arrives and a horrified Michael turns the laptop screen so the doctor can see what Michael has discovered: Michael was a Wraith and these folks did something to him as an experiment, transforming him into a human over the course of many painful days. Michael learns that Wraith have evolved with a combination of human and iratus bug DNA. Using a retrovirus carefully engineered by Carson Beckett, the bug DNA can be suppressed allowing the human DNA to take over and remake the individual into a human. Michael is in anguish over the lies and the nature of the experiment, and over the discovery that he is his people’s own worst enemy — he’s not even one of his people at all. He is quick to question the ethics and motivations of the humans. Who gave them the right to do this to him? How do they know that being human is better than being a Wraith? He also tells Heightmeyer that the things he has been feeling for days now make sense: it’s the hunger, the aggressiveness, the suppressed instincts of a Wraith. And now that he knows what they are, he feels them more intensely. Weir’s justification is that the Wraith will do anything to humans so they can feed. Naturally, humans have a right to defend themselves. But the retrovirus is not a permanent solution yet. Daily injections are necessary to keep the bug DNA at bay. She debates continuing the experiment with the senior staff; Ronon urges them to kill Michael and be done with it, arguing that no matter how human he looks and acts, he’s still a Wraith inside. Over ethical objections, Weir orders the experiment to continue. Beckett will increase the dose of the retrovirus in the hopes of still finding long-term success. But on the way to get the injection, Michael overpowers his guards and tries to escape. He is recaptured — but not before killing Sgt. Cole, though he is anguished over having to do it. For everyone’s safety, Weir sends Michael to the Alpha Site to continue the experiment. There he uses Wraith mind control to make Teyla release him. 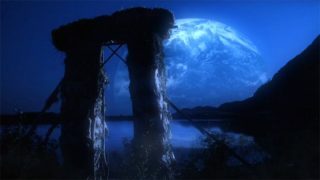 Before Michael takes her through the Stargate, Teyla manages to leave the new address scratched on a stone by the D.H.D. Michael was drawn to a world with a hive ship, and without the drug he quickly begins to regress back to being a Wraith. Struggling with the last of his humanity, Michael gives in to his urge to feed on Teyla. In the nick of time, Sheppard arrives to shoot Michael. The Wraith from the nearby hive ship recover Michael, who is still alive and no doubt able to reveal that Atlantis was not destroyed in the siege after all (“The Siege, Part 3”). The Atlantis team realizes the Wraith know Atlantis survived. Now, they must prepare for a new Wraith attack. “Michael” carried the working title “Charlie” during the writing process. “I don’t want to sound too gushy, but I loved performing with Connor [Trinneer]. The first time I met him it was great because he’s an extremely talented actor who enjoys getting into the story. There’s a certain appreciation and excitement when you’re doing a scene with a fellow actor who is really, really on top of things and interested in the various nuances of character as well as relationship. Connor is certainly one of those actors and was from the get-go with the Michael character. VOTE! How would you rate Atlantis's "Michael?"